I’m reading Elizabeth Bowen for the first time and finding it a slow-going but exhilarating experience – perhaps the closest comparison, in terms of necessary application to the page, is Javier Marías, someone else who won’t be rushed, whose paragraphs flow like dark syrup, not clear water. One of the things that has most struck me – and that is very different from Marías – is the utter contingency of Bowen’s descriptions. Things are always shown in the light of the moment, not with any definiteness; so much so that you’d almost think that, were you to glance away from the page, and back again, the words on it would have changed, with the movement of a cloud across the sun, or the bough of a tree across a window. The sun had been going down while tea had been going on, its chemically yellowing light intensifying the boundary trees. Reflections, cast across the lawn into the lounge, gave the glossy thinness of celluloid to indoor shadow. Stella pressed her thumb against the edge of the table to assure herself this was a moment she was living through – as in the moment before a faint she seemed to be looking at everything down a darkening telescope. Having brought the scene back again into focus by staring at window-reflections in the glaze of the teapot, she dared look again at Robert, seated across the table, between his nephew and niece. 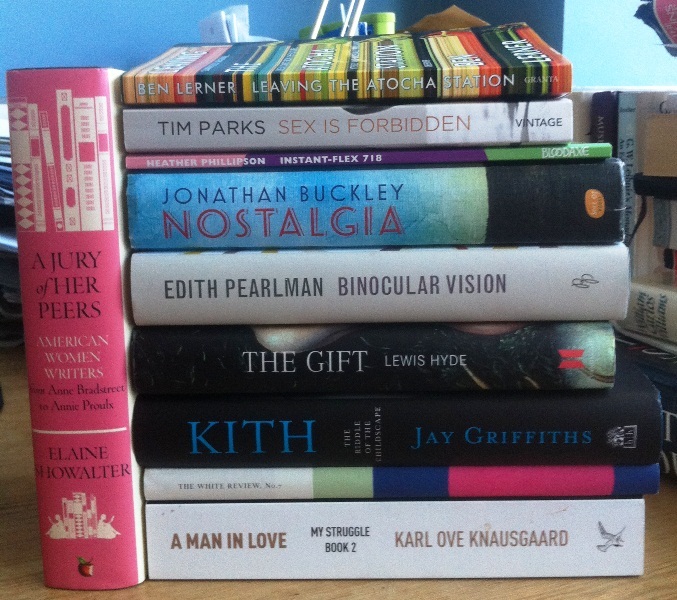 Okay, so here’s my pile of books from April. Some can be dispensed with quickly: the Knausgaard I wrote about here; the Tim Parks was mentioned in my March reading, about pockets of time and site-specific reading; the Jonathan Buckley (Nostalgia) was for a review, forthcoming from The Independent; the White Review, though I read it, stands in for the shortlist of the White Review Short Story Prize, which had my story ‘The Story I’m Thinking Of’ on it. In fact, a fair amount of April was spent fretting about that, and I came up with an ingenious way of not fretting: I read all the other stories once, quickly, so as to pick up their good points, but I read mine a dozen times or more, obsessively, until all meaning and possible good qualities had leached from it entirely, and I was convinced I wouldn’t win. Correctly, as it turned out, though I’m happy to say I didn’t guess the winner, Claire-Louise Bennett’s ‘The Lady of the House‘, the best qualities of which absolutely don’t give themselves up to skim reading online. It’s very good, on rereading, and will I think be even better when it’s read, in print, in the next issue of the journal. That leaves Jay Griffiths and Edith Pearlman. Giffiths’ Kith, which I have only read some of, I found – as with many of the reviews that I’ve seen – disappointing. Where her previous book, Wild, seemed to vibrate with passion, this seems merely indignant, and the writing too quickly evaporates into abstractions. In Wild, Griffiths’ passion about her subject grew directly out of her first-hand experience of it – the places she had been, the things she had seen, lived and done – and the glorious baggage (the incisive and scintillating philosophical and literary reference and analysis) seemed to settle in effortlessly amongst it. Here, the first-hand experience – her memories her childhood – are too distant, too bound up in myth. The Pearlman – her new and selected stories, Binocular Vision, I will reserve judgement on. It’s sitting by my bed, and I’m reading a story every now and then. The three that I’ve read (‘Fidelity’, ‘If Love Were All’ and ‘The Story’) have convinced me that she is a very strange writer indeed, and perhaps not best served by a collected stories like this one. Those three stories are all very different, almost sui generis, and each carries within itself a decisive element of idiosyncrasy that it’s hard not to think of as a being close to a gimmick. They all do something very different to what they seemed to set out to do. They seem to start out like John Updike, and end up like Lydia Davis. Which makes reading them a disconcerting experience, especially when they live all together in a book like this. It makes the book seem unwieldy and inappropriate. I’d rather have them individually bound, so I can take them on one-on-one. Then they’d come with the sense that each one needs individual consideration. More on Pearlman, I hope. The book that I was intending to write more on, this month, was the Ben Lerner, Leaving the Atocha Station, which I read quickly (overquickly) in an over-caffeinated, sleep-deprived fug in the days after not winning the White Review prize, which also involved a pretty big night’s drinking.